Girls from TAG help make candle lighting packages to hand out at the Great Challah Bake. How do you explain the beauty of Shabbos to others? How can those who have been celebrating Shabbos for decades ignite a new spark? What does it take to get someone to experience a taste of Shabbos for the first time? South African Chief Rabbi Dr. Warren Goldstein asked these questions when he began The Shabbat Project in in 2013, challenging the community to keep the Shabbat of October 14 together, with astonishing success. In short time the idea spread to more continents and communities, lighting up the Jewish world with the excitement of communal Shabbat events. The Shabbat Project has spread to 97 countries and nearly 1500 cities across the world. This year, The Shabbat Project is taking place October 26 and 27. In the Five Towns and Far Rockaway, perhaps the most prominent Shabbos Project event is the Great Challah Bake (challahbakeli.com), scheduled this year on Wednesday, October 24 at the Sands Atlantic Beach. The Challah Bake started in 2014 with 800 women and has grown to 1,300 women as word of the uniqueness and inclusivity of the event has grown. “One of our goals is to promote Jewish unity by sharing the beauty of Shabbos with those who have never experienced it. We seek to embrace Jews of every type and bring them into our community by joining hands to do a mitzvah,” said Mrs. Adina Fischlewitz, co-coordinator of the Five Towns Great Challah Bake. But, the Shabbos Project just like Shabbos itself, isn’t limited to challah. This year, Mrs. Fischlewitz, chairwoman of Shabbos Project events in the Five Towns and Far Rockaway, is challenging people young and old, secular and observant, scholars and laypeople to find new ways to experience Shabbos. “Every Jew whatever their background has the opportunity to enhance their Shabbos experience and bring it to a heightened level. What makes the Shabbat Project unique is sharing the experience with Jews from all over the world together.” Mrs. Fischlewitz said. On Monday, October 22, girls 12 and older will meet at the Marion & Aaron Gural JCC Harrison Kerr Family Campus, to make their own candle holders for “Let’s Light Shabbat,” an initiative to elevate the mitzvah of lighting Shabbos candles by tapping into girls’ creativity and individuality. Space is limited. To register go to challahbakeli.com. Thursday, October 25 is the day for “Let’s Explore Shabbat,” where schools, shuls and outreach organizations will host educational events to delve deeper into the meaning and customs of Shabbos. NCSY, Partners in Torah, Chazaq, JEP, Young Israel of Lawrence Cedarhurst, Young Israel of Bayswater and others are planning programs for grade schoolers through teens, some including parents. The collaborative program by Chazaq, JEP, NCSY and Partners in Torah invites men and boys ages eight and up to learn about the meaning of Shabbos. Boys must be accompanied by an adult. To register go to challahbakeli.com. Further details about “Let’s Explore Shabbat” programs will be available online. Late next week, people may see images of candles and light on the sidewalks in their neighborhoods. That is because children, pre-teens and teens are planning “Let’s Chalk Shabbat,” using chalk sticks, chalk spray and stencils to apply symbols of Shabbos on the sidewalks outside of schools and around our neighborhoods. Children, pre-teens and teens are using Instagram, Pinterest and their own G-d given creativity to come up with stencils and freehand art for their sidewalks. Young Israel of West Hempstead is partnering with Hebrew Academy of Nassau County to host a communal Shabbos dinner. Participants are being asked to bring challah covers and kiddush cups from their grandparents or great-grandparents to symbolize the continuity of Shabbos. In the Five Towns, most Jews are observant, from Chassidish to Litvish, to Sephardic, Yeshivish, Orthodox, Modern Orthodox or “Just Plain Jewish.” While the initial impetus for The Shabbat Project was to give non-observant Jews a taste of what Shabbat has to offer, that may be hard to do in a community such as ours. That is why Mrs. Fischlewitz is promoting “Let’s Block Shabbat,” an initiative for neighbors to get together, meet each other and elevate their Shabbos experience. “We can all learn from each other. Maybe your neighbor had a Shabbos experience that will touch you in some way. We need to break down the barriers of the work week, of our schedules, of our own labels in order to create a dialogue and learn from each other. “Dark Tisch” without lights to allow participants to focus on their feelings rather than their surroundings. To add your “Let’s Block Shabbat” program to the list, email: shabbosprojectli@gmail.com. “All of these activities fit with this year’s Shabbat Project theme: Stop Doing. Start Being. Shabbos isn’t just a day of rest. 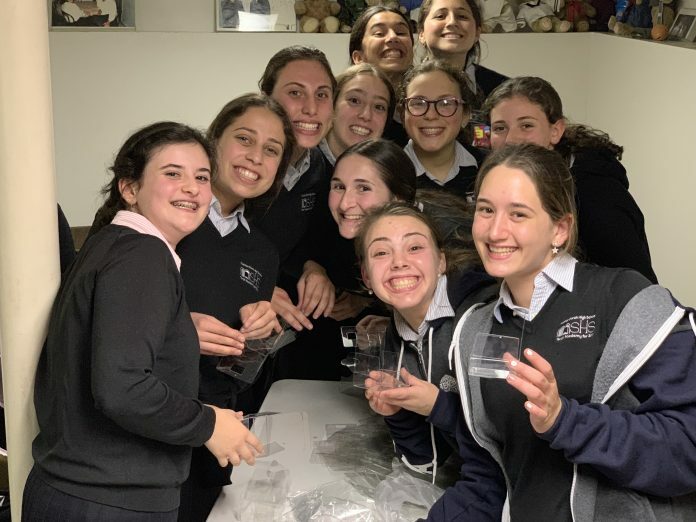 It is a day of exploring and connecting with ourselves, with our community and with Hashem,” Mrs. Fischlewitz said.